Thank you for posting an artwork that reminds me to keep praying for the people of Newtown. A handsome image, and a fitting tribute. Thanks, Yvette. I love Käthe Kollwitz, thank you Yvette for this lovely painting. Yes, we have the tragic of Newtown in our mind as well. Thank you everyone and you're most welcome. Didn't know what to say - what CAN you say? So I'll let the artwork speak for me. 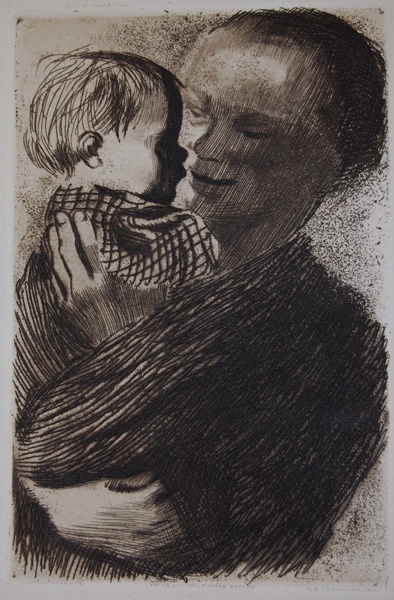 I grew up with two Kathe Kollwitz drawings in our dining room. My family loved her artwork. What incredible human feeling and compassion for other people. Few rival Kollwitz, in my opinion. I could weep just looking at her drawings. I agree Kathy. I posted a much darker toned one on my Facebook page because I was so angry at the time. I'm back seeking maybe a mere smitch of comfort from the picture you posted. This is a rough one, Sparkle. None of us will ever be the same. There's no way to get over it other than to go on living in the best way we can. This is a defining moment for our country and for us. I'm going to celebrate Christmas this week in the best and most cheerful way possible. But that won't mean my heart (what's left of it anyway) isn't broken. The artwork does speak louder than words, Yvette. I am very sorry about what happened in Newtown. Thank you, Prashant. Really, in the end, sorry is all we can be.